SAVANNAH, Ga. - An autopsy is planned for Friday after a handcuffed man was shot and killed by police in Savannah, authorities said. Police arrested Charles Smith, 29, on outstanding warrants and placed him in a patrol car Thursday on the city's west side, Georgia Bureau of Investigation spokeswoman Sherry Lang said. Smith was arrested and handcuffed with his hands behind his back, Lang said. After being placed inside the patrol car, he was able to move his hands to the front of his body and also kicked out a window of the car, she said. "The officers said as Smith attempted to exit the patrol car, they saw that he had a firearm," Land said in a statement. He was then shot by an officer. A gun was found under Smith's body during the crime scene investigation, Lang said, and the "arrest encounter" was captured on video. It was not immediately clear whether video recorded what happened outside the patrol car, inside it, or both. None of the video has been released. 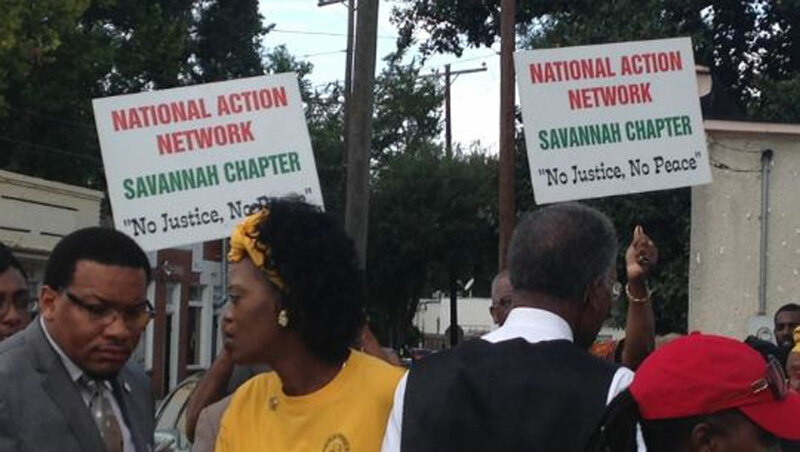 The police officer, 10-year veteran David Jannot, has been placed on paid administrative leave pending the outcome of the investigation, Savannah-Chatham Metropolitan Police spokesman Julian Miller said in a statement. Police requested that the GBI investigate the shooting, and findings will be turned over to the Eastern Judicial Circuit District Attorney's Office, authorities said. After the shooting, which happened shortly after 11 a.m. Thursday, crowds of onlookers gathered near the scene. Demonstrators protested the shooting, but they remained peaceful. Mayor Edna Jackson urged citizens to be patient with law enforcement officials while they investigate. Jackson said she met with Smith's family, west Savannah residents and police leaders after the shooting. "When the answers come, we will be open, transparent and forthcoming," Jackson said in a statement. "We will remain in continuous communication with the family." Police have not said how many shots were fired, nor have they explained how Smith was handcuffed and placed inside the patrol car when they say he had a gun. "The issue I have at this point is why wasn't he searched before he got in the police car?" Smith's godmother, Martha Holmes, told The Savannah Morning News. "How did he get in the back of the police car with a gun?"